We’re back to teaching our fellow artists, writers, and musicians on how to take care of their earnings from gigs and bookings and how to make them grow to achieve their future financial goals. This time around, our lady volunteers from Angat Pilipinas Coalition for Financial Literacy who are artists themselves in their own rights, will be sharing with us their knowledge and experience in managing their finances and investing them in various financial instruments. The FREE workshop will take place on March 2, 2014, Sunday, at 2PM at the UCC Cafe Burgos Circle near Cantinetta/Johnny Rockets, Forbes Town Center, Taguig City. 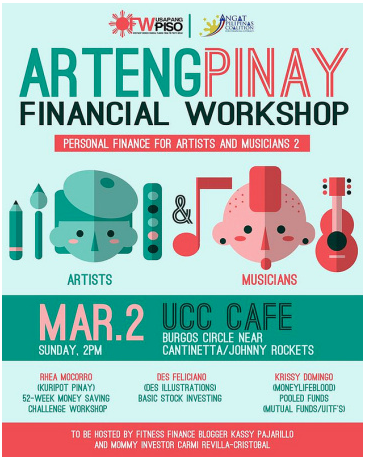 The workshop will feature Kuripot Pinay (Rhea Mocorro) and her 52-Week Money-Saving Challenge, Mercedes “Des” Feliciano of Des Illustrations (Shell national arts competition champion) will share her investing journey in the stock marketstock marketstock market as an artist, and blogger/finance advocate Krissy Domingo (moneylifeblood) will discuss about investing in pooled funds (mutual funds/UITF’s). The workshop will be hosted by yours truly, fitness finance blogger Kassy Pajarillo and mommy investor Carmi Irene Revilla-Cristobal. Text your complete name, email address, and mobile number to +63 917 5540014 or email mktpajarillo@gmail.com. The workshop is FREE but you have to grab your own cup of coffee to join the workshop. Register now and invite your friends to come! Be financial literate! No artist nor any of us should starve! For FREE Financial Analysis, you may book your appointment through mktpajarillo@gmail.com or send-in a message to the number stated above.